Florian's Fishes is a puzzle in which each piece comprises two squares plus four equilateral triangles. This puzzle uses the full set of 49 distinct pieces. 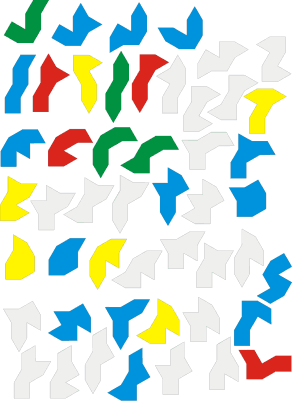 In other tessellations (tilings) of the plane, mathematical methods can be applied in helping to derive solutions. This does not appear to be the case for solving Florian's Fishes, which probably demands trial and error methods. This kind of puzzle can be quite challenging for experienced puzzlers. The puzzle board looks like an ocean (blue) with a dolphin and two fishes. 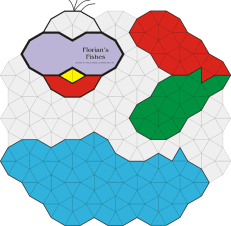 For a complete solution, the pieces must fill the entire area of the game board. Players who solve this puzzle could become great puzzlers!